Little E doesn't have much of a bedtime routine at the moment. In fact, as I write, he's crashed out on his Daddy's chest while we watch TV. Although he's now eight months we don't really seem to have got into the habit of putting him to bed on his own yet. He happily snoozes the evening away downstairs with us and we get extra cuddles which are sometimes missed with a demanding big sister and brother around in the daytime. That said, I've noticed that he seems to be getting increasingly unsettled in the evenings as he gets more active in his own right and I think it is about time to establish a bedtime routine. 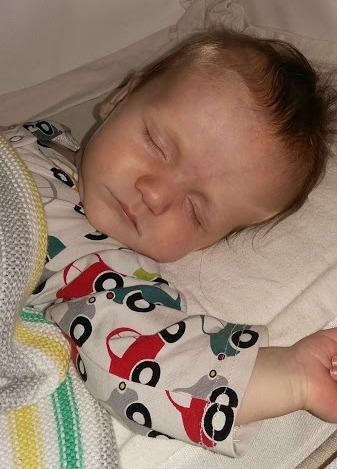 I had a very timely approach from JOHNSON'S® Baby who have invited Little E and I to try their new clinically proven* 3-step approach to baby bedtimes, which uses their bedtime range of products to help babies fall asleep faster and stay asleep longer. Over the next two weeks Little E and I will spend one week following our usual bedtime routine. In practice I'm going to start trying to get him into his cot rather than keeping him downstairs with us. Following that week I will be using the JOHNSON'S® 3-step routine to see if we can make the whole bedtime process easier and calmer. 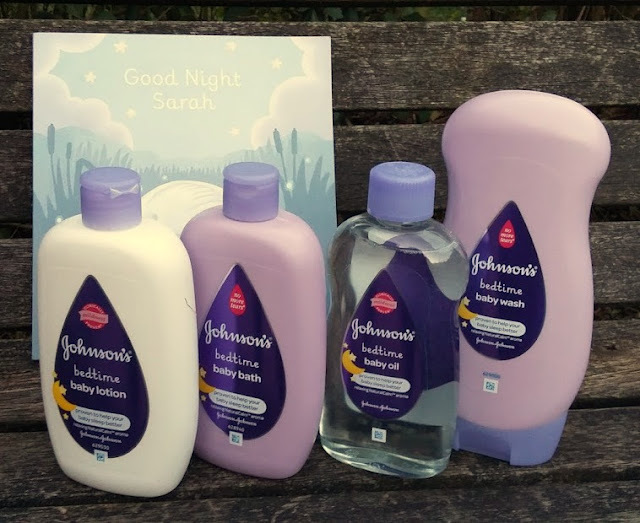 JOHNSON'S®' 3-step routine uses their Baby Bedtime range of products and we've been sent the Bedtime Bath, Wash, Lotion and Oil and a story book to use in the second week. The first step in the routine is Bath. JOHNSON'S® recommend starting the evening routine with aa warm bath using the Bedtime Bath or Wash. We don't have a bath so this will see Little E being showered using the Bedtime Wash or having a bath at Grandma's when he can have a splash in the Bedtime Bath. All three of my children love both the shower and the bath and I'm hoping that the relaxing fragrance and soft bubbles will start the relaxation for the evening for Little E.
Step two is Massage. I've enjoyed using baby massage techniques on all of my babies and I think they have all enjoyed the relaxing and calming post-bath massage. I'll be using the Bedtime Lotion for this and taking the opportunity for some extra snuggling while we do so. The third and final step is Quiet Time.We've been supplied with a book called 'Good Night Sarah' which has been developed by the makers of JOHNSON'S® to read at bedtime. The bedtime story is an important part of Bud and LM's bedtime routine so I'm really keen to bring it into Little E's too. It's such an important time of our day and I love snuggling up with my little ones and sharing a story. I'm going to be keeping a diary of Little E's bedtimes over the next two weeks to record if the JOHNSON'S® 3-step routine has an effect on how well he settles and how long he sleeps for. He doesn't sleep through and most nights still wakes at least twice. I'd settle for this being reduced to onc and be very happy if it does. I'll be reporting back on how we find the routine in two weeks. *Sponsored blog post by the JOHNSON'S® brand, I have received payment incentive and samples but all opinions are my own. JOHNSON'S® 3 step routine consists of bath, massage and quiet time, tested on babies 7 months+, 1 week+ use.